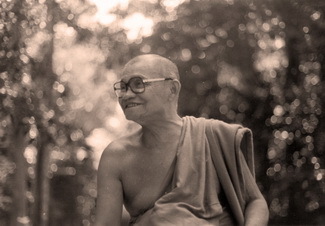 This year’s Forest Sangha calendar commemorates the centenary of the birth of Venerable Ajahn Chah. It is dedicated with gratitude and respect for the many offerings that he made to samanas and lay people through his teachings and his example. The simplicity of his teaching immediately struck home when in 1987 a good friend returned from Thailand and shared a collection of Ajahn Chah’s dhamma talks in a small booklet, A Taste of Freedom. So began a deep respect for this humble Thai monk and the sustained Theravada lineage from the Buddha. “ About this mind… In truth there is nothing really wrong with it. It is intrinsically pure. Within itself it’s already peaceful. That the mind is not peaceful these days is because it follows moods. The real mind doesn’t have anything to it, it is simply (an aspect of) Nature. It becomes peaceful or agitated because moods deceive it. The untrained mind is stupid. Sense impressions come and trick it into happiness, suffering, gladness and sorrow, but the mind’s true nature is none of those things. That gladness or sadness is not the mind, but only a mood coming to deceive us. The untrained mind gets lost and follows these things, it forgets itself. Then we think that it is we who are upset or at ease or whatever. But really this mind of ours is already unmoving and peaceful… really peaceful! Just like a leaf which is still as long as no wind blows. If a wind comes up the leaf flutters. The fluttering is due to the wind — the “fluttering” is due to those sense impressions; the mind follows them. If it doesn’t follow them, it doesn’t “flutter.” If we know fully the true nature of sense impressions we will be unmoved. 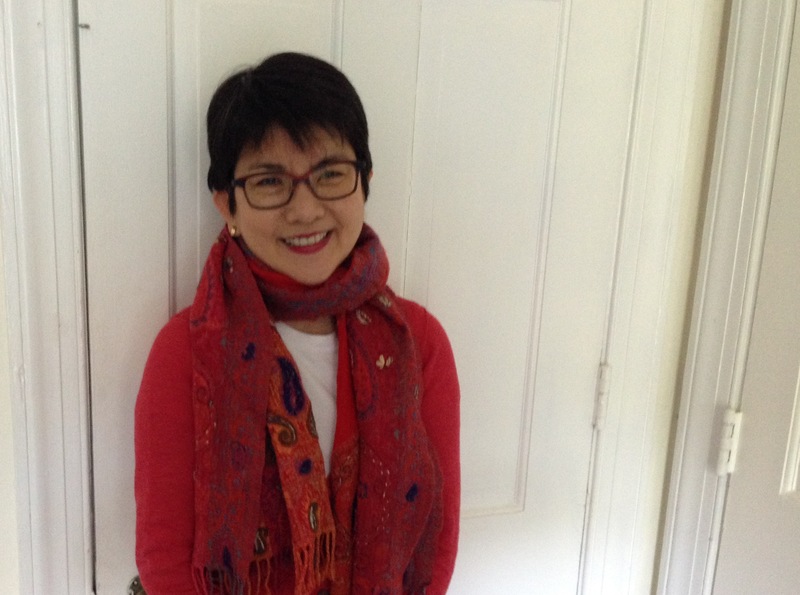 January 5th – Friday Evening Meeting Quaker House with Evelyn Tan 7:30 pm 91A Fourth Ave, Ottawa. The evening will be led by lay practitioner Evelyn Tan and will begin with a 45-minute guided meditation followed by a recorded ‘dhamma’ talk, Evelyn Tan first learned about Buddhism, mindfulness and vipassana meditation largely through the Ottawa Buddhist Society when she and her family moved to Ottawa some twenty years ago. She facilitated MBCT groups at The Ottawa Hospital Rehabilitation Centre from 2011-2015 and is now in private practice. 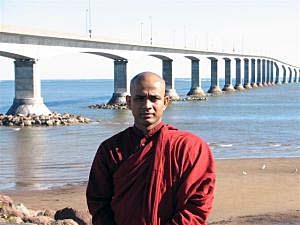 Bhante Jinananda is an Ottawa monk at the Hilda Jayewardenaramaya Buddhist Monastery and meditation centre. ‘Bhante J’ has been in North America for over several years and has been a qualified meditation master for decades in Theravada Buddhist tradition. 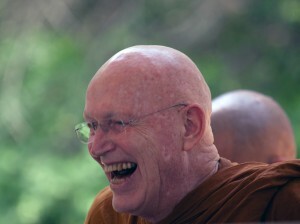 These days of silent meditation and dhamma reflections are conducted by a visiting monk or nun. The Days of Mindfulness run from 8:30 a.m. to 3:30 p.m. and include periods of sitting meditation, walking meditation, dhamma readings, listening to dhamma talks (from either an invited monastic/nun or else a taped talk chosen by a senior OBS member), occasional discussions. 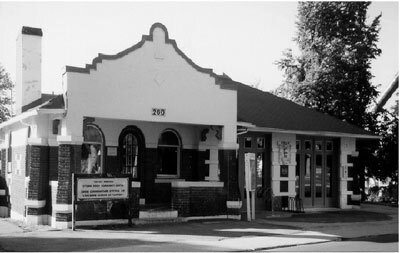 Sunday January 28th – Annual OBS General Meeting and Social at Ottawa South Community Centre, the Old Fire hall 260 Sunnyside Ave. 2:30 – 5 pm. Please bring a tea mug and your favourite sweet or savoury snack to share. All members and friends are warmly welcome to attend. Our gratitude to Anoma de Silva for sharing this precious video recording honouring LP Sumedho most recently in Sri Lanka. It also includes his dhamma talk on the Sound of Silence.